Since 2003 DirectAdmin has been developed continuously with hosting technology development in mind. Always focused on staying up to date on the latest security and stability measures as well as bringing to practice global trends and clients feature requests. Install SSL certificates, Perl modules. Monitor server information. Set cron jobs, mime types, and Apache handlers, enable site redirection and domain pointers via DirectAdmin control panel. The multilingual interface lets you install a new language pack easily for your interface. The most popular open-source database management system. MySQL replacement with improved performance. MariaDB is led by developers of MySQL with high compatibility. Apache is the most popular web server software. Standalone, other Web and HTTP Proxy Server with high performance and low memory usage. Nginx does not support .htaccess and CGI. Apache replacement. Supports HTTP 2/0 and built-in page caching as well as advanced .htaccess caching. Fast LiteSpeed SAPI for PHP. It's a commercial 3rd party product. Highly configurable FTP server software. Free, lightweight FTP server with high flexibility and easy management. A standard PHP module for Apache. Works in combination with mod_ruid2 to run PHP scripts under user privileges. An alternative PHP FastCGI implementation that allows a website to handle high loads and it is useful for sites of any size. PHP-FPM is faster than traditional CGI-based methods. FastCGI is a protocol for interactive interfacing programs with a web server. Reduces memory footprint of the web server than mod_php. It allows a server to handle more web page requests at once. LiteSpeed Server API for PHP. Up to 50% greater performance than Apache with mod_php. Up to 20% better performance than FastCGI. It is compatible with LiteSpeed Enterprise web server only, except for CloudLinux OS. On this operating system, it is supported with Apache web server." Web Console to manage MySQL databases. IMAP client with an application-like user interface based on the browser. The multilingual tool with unlimited users and messages. Brute-force login attack and sophisticated privacy protection. SquirrelMail is a standards-based webmail package written in PHP that supports SMTP and IMAP protocols. Robust functionalities such MIME support, address books, and folder manipulation. Powerful and featureful tool to generate advanced statistics graphically. Lightweight and fast log file analyzer. Dovecot is an open source IMAP and POP3 MDA (Mail Delivery Agent) for Linux/UNIX-like systems. Responsible for receiving and sending email messages. A mailing list manager written in Perl. Email spam filtering system based on open source. Classifies email and block SPAM. Antivirus engine for detecting Trojans, viruses, malware & other malicious threats. Supports scanning of email messages, FTP and PHP uploaded files. ModSecurity is an open source firewall based on the web application. Supported in Apache, Nginx and LiteSpeed web servers. Running servers all around the world. What is the price for DirectAdmin? 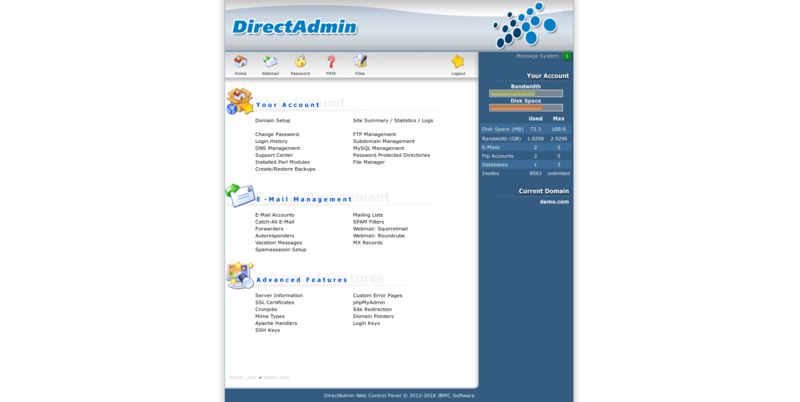 DirectAdmin license price is 19.99 EUR as a one-time fee. The license will be valid as long as the server will be active. The license can be ordered only with a new server. What operating system should I choose? You can install a DirectAdmin control panel easily within few mouse clicks via the client area bythese steps. Do I need to install any other server services (Apache, PHP, etc.)? No, you do not need to install any other services. 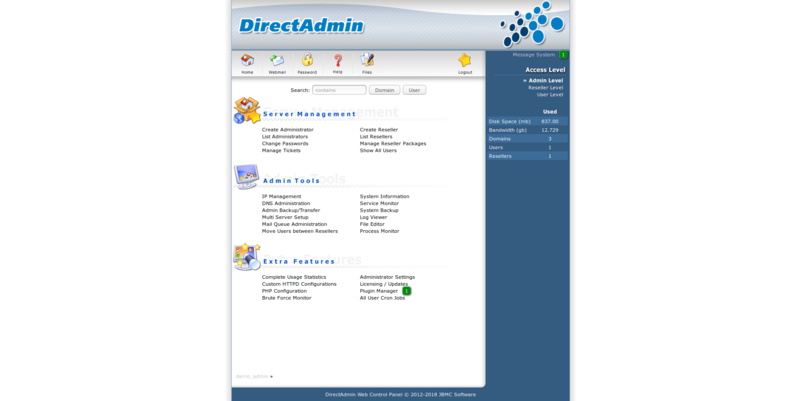 Please see above, what services are included in the DirectAdmin control panel package. I can see that your template is with CentOS 7 operating system. Can change it? You are free to choose any other operating system. Please select an operating system without any control panel and install DirectAdmin manually. After installation, please contact our support team by opening a ticket. Do you provide root access to the server? Yes, we provide root access to each of our servers. Do you provide an IP address? Every VPS on our system has a dedicated IP assigned. Can I transfer a license to another server? No, there is no possibility to transfer DirectAdmin license to another server. Our support team is ready 24/7 to assist you. Please contact us via ticketing system or live chat.